Thomas Conveyor and Equipment Co associates have been designing, procuring and installing Rail Car Unloading Pneumatic Conveying Systems for decades. 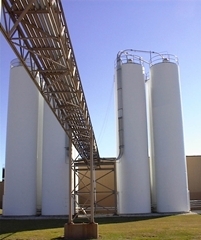 We are Professionals in the integration of Dry Bulk Powder Handling Systems. We design the correct system for your manufacturing production facilities by presenting to you why and how the bulk system should be put together to increase your ROI. We will take on your project from beginning to end out of our Hillside, IL office. No middle men are used during this process. The same people who take your phone call are the same people that will turn on the switch at start up. Please review our website in detail and you will find that we are the correct choice in supplying your next and future Rail Car Unloading System. Thomas Conveyor and Equipment Company’s associates have been designing, procuring and installing rail car unloading pneumatic conveying systems for decades. We are professionals in the integration of dry bulk powder handling systems. We design the correct system for your manufacturing production facilities by presenting to you why and how the bulk system should be put together to increase your ROI. We will take on your project from beginning to end out of our Illinois based office. No middle men are used during this process. The same people who take your phone call are the same people that will turn on the switch at start up. Please review our website in detail and you will find that we are the correct choice in supplying your next and future rail car unloading system.